SJT tests are a popular psychological tool used by assessment companies, employers, and organisations to evaluate applicants' behavioural and cognitive abilities when introduced with hypothetical, daily work-related situations. It's designed to reveal different personality aspects, as well as cognitive abilities and social skills of the future employee. The objective of the test is to evaluate your compatibility to the company as well as your potential growth in it. Situational Judgement Tests do not have a specific format and often have different criteria. They are often tailored according to the personal needs of the hiring company and made according to the key competencies of the specific company. Find out what you’re up against by Trying out a test sample. Secondary competencies are essentially practical skills, abilities and personality traits that are linked to certain core competency like shown in the diagram below. So, to sum it up, you can expect each scenario on the test to assess you on one core competency while examining at least one secondary competency. Your answers should therefore reflect a certain secondary competency or a balance between two or more. Instructions – this bit differs between companies (this is why we made you tailored solutions). Generally, this type of questions have 2 sub-types: Behavioral Tendency and Knowledge. In the first you will be asked to identify how you would be likely to behave in a given situation; and in the second you will need to evaluate the effectiveness of possible responses to give situations. Fun stuff. - So knowing the specific test you are facing can help you choose the right practice tests and get better results for your time and effort! You can use the free sample test on this page to get a feel of these in a realistic setting. Good news, in most cases there is no time limit to SJTs! The reason is that your answers are more important than snap responses typically given during timed examinations. Thus, it is imperative that you answer correctly according to the specifications of the prospective employer. Competencies: Problem-solving; working under supervision; integrity; thoroughness/attention to detail. Response (B) employs the practice of admitting mistakes and sharing responsibility. Although Travis played a larger role in committing the mistake while gathering the data, by sharing the responsibility for the mistake, you are showing that you are a team player (teamwork). By telling the supervisor that both of you have made an error you are showing that you are responsible and have the integrity of admitting your mistakes – thus allowing your supervisor to take the possibility of being late for the deadline into account. By working together to amend the mistake – your team has the potential of solving the task effectively by the deadline. This question tests for the ability to share responsibility in a team and the ability to admit mistakes while having the willingness to correct them. The trick for solving the question is to choose the response that employs both integrity and teamwork- while solving the problem effectively. Response (A) may seem like the correct response as Travis is certainly responsible for the problem. However, by dropping all the blame on Travis and not offering to work together on solving the problem- you show that you are unwilling to share the responsibility- thus showing low teamwork competency. Also, by criticizing Travis behind his back you might cause unnecessary damage to his relationship with the supervisor- as he should be given a chance to explain himself. Response (C) lacks responsibility and problem-solving. Handing the supervisor notes is only a partial solution if the supervisor hasn't agreed to this solution- and is not prepared in advance for this solution. The quality of your work here is diminished – so you are also showing a lack of thoroughness and attention to detail. It is difficult not to choose response (D), as willing to work together with Travis in order to solve the problem on time shows a high level of teamwork. 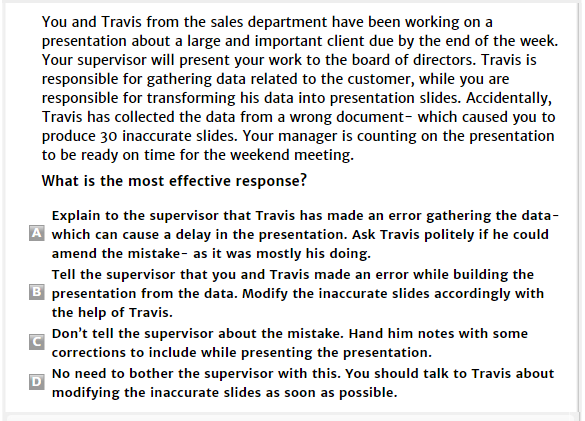 Since the intention communicated in this answer-choice is to “not bother” the supervisor- choosing this question reveals a low level of being responsible and a problem with working under supervision- as you are not allowing your supervisor access to valuable information which could affect his decision-making regarding the presentation and the deadline. When interacting with angry customers, you want to show empathy at first, then as quickly as possible direct the conversation to problem-solving. Empathy makes the customer feel cared for and removes some of the heat. Now, when your customer is less emotional, you can take the conversation in a more rational direction and focus on solving the problem. Answer choice A involves listening to the customer, which shows empathy. In answer choice B you are asking the customer to calm down, instead of helping him to do so. The request itself could sound impatient (demonstrating a lack of self-control) and rude. Answer choice C is not the best response in this situation as it seems as if you are handing the problem to your manager because you don’t want to handle it yourself, or don’t feel competent enough. However, it’s not harmful to call the manager and in some situations, it could be a good response. Answer choice D is a good response to this situation as it focuses the conversation on problem-solving. Answer choice E is also good as it shows proactivity and responsibility in problem-solving. You can expect to find between 25 – 50 scenarios on any given SJT. The scenarios are usually engaging and challenging. After you are presented with a scenario you will then have to either find the most (or least) suitable response to the scenario or rank/rate the responses in order of effectiveness. How to Select the Correct Response in the SJT? Read each of the given scenarios and each possible response carefully before answering. Though one answer choice may seem appropriate, there may be another one which is more sensible. If the question asks you to rank the responses, compare them to each other. However, keep in mind that all the responses may be effective, or they may all be ineffective - your task is to rank the responses, not decide if they are right or wrong. The situational judgement test is a popular pre-employment psychological test which allows an employer to assess your judgement and decision-making abilities. Being able to quickly identify and come up with solutions to issues in the workplace is a highly sought-after skill for a variety of roles. Exposing yourself to this type of test will help boost your confidence and improve your chances of success. You can begin to practise graduate, customer service, administrative positions, management, MI5 and police SJTs right here with us. Which Employers use Situational Judgement Tests? The situational judgement test is commonly used by entry-level corporate jobs. This especially reins true for incoming graduates. Corporate managerial positions commonly are screened by SJTs along with specific jobs such as marketing, medical, sales and customer service. Government jobs (police, MI5, firearms, etc.) are also in this category. To find your specific SJT PrepPacks™ take a peek on the sidebar. Employers are looking to measure how you compare to an ideal candidate based on their core competencies. The usage of SJT helps ensure that they are hiring individuals who are inclined to problem-solving. Therefore, it is crucial that you research the company you are applying for and practise for your SJT beforehand. It's best to reach an 80% in your SJT. Bear in mind that your overall score will also be compared to other job candidates. Thus, it's best to try to score as high as possible. As these scores will be compared to the company's core values, it cannot be stressed enough; studying your chosen company's core values is a must when it comes to applying for jobs. This also will allow you to gain leverage compared to the other candidates. What are the Question Styles in an SJT Test? The scenarios presented on Situational Judgement Tests always ask for a resolution of a given conflict which, although being hypothetical, might very much rely on, or represent, realistic situations that occur in a workplace. You are asked to choose a preferred method of action out of many possible options. You are encouraged to choose your responses spontaneously, based on intuition. What are the Difficulties you can Face When Taking an SJT Test? There are a number of difficulties you face when encountering an SJT. First and foremost is the fact that the companies using SJT’s often want you to act in a spontaneous fact. If we think about this for a second, we know that this isn’t the case. When you are asked as an employee to decide about a certain thing you are not making spontaneous decisions. You should be thinking about to do, even for a few seconds, before following it through. There are questions in the SJT that need careful thought and are designed to catch you out. 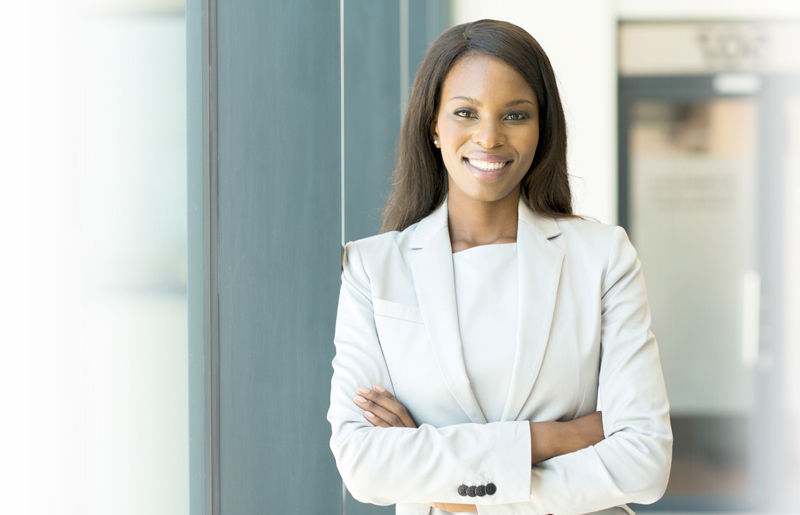 However, with careful preparation and our expert guidance, you will gain the skills needed to show the employer that you are the one for the job. Understanding your test results vary depending on the company you are applying for. It is recommended to look at your chosen company and compare their core values and see how your answers line up. In this way, you will further drill how to score correctly according to the company's policy. The results basically tell you where you stand in comparison to other test takers. This is measured on a great number of people and the score you receive reflects the place (or percentile) where your results fall on the distribution curve. Sounds complicated but its easy to understand. Just take a look at the 2 following examples based on scoring feedback reports from real test providers. Your responses were scored, and you result was compared with that of other UK graduate and junior managers. In comparison with this group, your test score suggests tour awareness to judge the appropriateness of responses to situations is average. Your percentile score means you equal to or greater than 36% of UK graduates and junior managers. As we have already discussed, passing SJTs is very difficult as it’s hard to know the best answer. A good way to improve your situational judgement test and problem-solving skills is to practise with materials and tips created by trained psychologists who understand the deeper logic behind the questions. As previously stated, our free online situational judgement test was designed to give you an idea of what our full PrepPacks™ can do for you. You will find a variety of SJT preparation materials on our website for a numerous job and experience levels. The packs that we offer include those for administrative, graduate and management situational judgement tests. Our most popular situational judgement test PrepPack™ includes practice for each of the packs listed above. Regardless of the pack(s) you decide to use, you will gain access to study guides, video tutorials and full answer explanations. Start preparing today to ace your situational judgement test.